Become a Certified Feng Shui Practitioner & build a career by helping others improve their environment, health and lifestyles. We integrate many aspects of classical Feng Shui, health and ecological awareness, space clearing and other topics into a time tested certificate practitioner course. Discover the richness of eastern philosophy and the ancient principles of Feng Shui applied to our modern life. Learn design, how to use our lopan compass, Feng Shui astrology and much more. It provides you with a complete experience aimed towards you being a competent practitioner. Provides unique detailed comprehensive workbooks based on 25 years of advanced research, application and study tours to China and Hong Kong. There are 6 modules to be watched online needed for the completion of the Practitioner Program. You have the option of attending November 14-17th in house module. You can start the program at any time! The training is a series of unique seminars that makes Classical Feng Shui, Natural Healing, Sacred Geometry, Space Clearing and Ecological Design awareness - accessible, engaging, inspiring and EMPOWERING! • How to use the Form School principles, • How to use feng shui recommendations and design protocols, • Ming Gua and Ba zhai methods, • Flying Stars techniques, • Using the Lopan compass, • Four Pillars Astrology, • I Ching studies, • Taoist healing principles, Space Clearing, Sacred Geometry, • Sustainable Environments and Eco-Design principles, • Taoist natural healing processes, • Personal development and awareness. Everything you need to know about designing with basic and advanced Feng Shui principles. Roger Green's teaching is grounded and very accessible, providing information and knowledge that can be applied and used immediately. He is considered the number one pioneer and teacher of feng Shui in the western word, having created the first classical feng shui curriculum and taught in over 60 countries. He has sponsored over 10 International Feng Shui Conferences, lead several feng shui tours to China, india and South America. He is the past founder and director of the Golden Gate School of Feng Shui and the San Francisco School of Feng Shui. 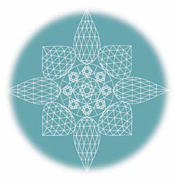 He is also presently the Founder and Director of the Academy Healing Nutrition and the Academy Sacred Geometry, along with the Breakthru-Technologies conferences. "The Taoist's elegant yet scientific approach to looking at nature allowed them to formulate some profoundly rational principles. In many cases it confirms our own instinctive ideas about what makes a happy and productive environment. Feng Shui builds on this intuition through the understanding of sound principles, allowing us to maximize beneficial energy flow, ideally in a way that is harmonious with our own unique culture, values, and beliefs. Using yin and yang as our infinite guide, we can explore how to become whole, how to adjust to changing circumstances, how to create health and balance in our lifes and other peoples." All trainings are held online. There is one optional in-house training you can attend with Roger Green, November 14-17th, 2019. A complete overview of all he topics are covered along with some practical on site work. We train and qualify you in our Nutritional Coaching and Holistic Health Counseling programs based on the Longevity Diet - that draws on the time tested healing arts of Macrobiotics, Traditional Chinese Medicine, Ayurvedic and cutting edge western nutritional theories. Learn how to take responsibility for your health and destiny from our highly respected international teaching faculty. Also includes practical hands on cooking classes. We put theory into practice! Discover Chinese medicine herbal remedies and tonics, that have a deep healing effect, and rejuvenate the mind, body and soul. Fantastic workbooks, study guides and resources. New York starts in October each year. This is also completeley available as a worldwide online training. Start at any time. View video clips from the ten modules. 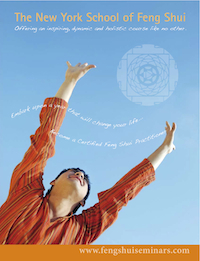 Feng Shui Practitioner graduates receive 20% discount on Academy of Healing Nutrition tuition. READ MORE about this dynamic life changing educational opportunity. Discover why Pythagoras said Sacred Geometry was the most important science, art and philosophy for a healthy society to learn. Technology is evolving - are you?